This post has been sponsored by Denny’s. All opinions are mine. When you’re looking for a yummy breakfast that is easy on the wallet, Denny’s is a great option! 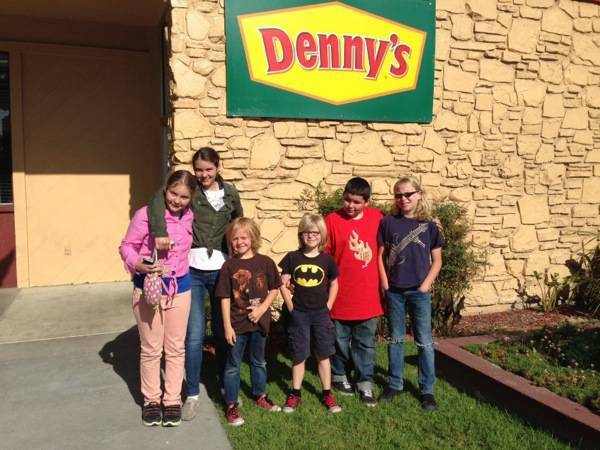 With six kids, Denny’s make it easy to go out and enjoy a delicious breakfast together as a family. Not only is it easy on the budget, but there is a wide variety of items to choose from – both for the kids and the grownups. Denny’s is America’s diner and has been where Americans have come for over 60 years to enjoy delicious food. Denny’s is open 24 hours a day, 7 days a week, every day of the year. One of my favorite breakfasts at Denny’s is their Grand Slam breakfast. The Grand Slam breakfast was originally introduced in 1977 and consists of eggs, bacon, sausage and pancakes. You can’t go wrong with the Grand Slam breakfast! To make things fun, Denny’s has even brought America’s favorite breakfast sweethearts to the screen! That’s right – they have eyes, mouths, appendages and opinions! You can meet Pancake, Bacon, Egg and Sausage HERE and check out their conversations that happen off-camera and online. Denny’s has also recently partnered with NASCAR race car driver, Denny Hamlin! Denny’s first love wasn’t racing, but was Denny’s Diner. That’s why he and his crew built a mobile Denny’s Denny’s Diner to take on the road this NASCAR season. He called it his Denny’s Denny’s – because it’s Denny’s! Be sure to head on over and enjoy a Grand Slam at Denny’s! You can follow Denny’s on Twitter and Facebook for up-to-date information and products. What is your favorite breakfast meal to enjoy at Denny’s? I love their ham and cheese omelets. We go to Dennys’ on nights they have kids eat free. My kids love eating pancakes for dinner. I had lunch at Denny’s last week. Always yummy food. Wish we had one nearby! We love how Denny’s revamped there menu not to long ago, they have much better options now, and even healthier choices. Kids love it here.